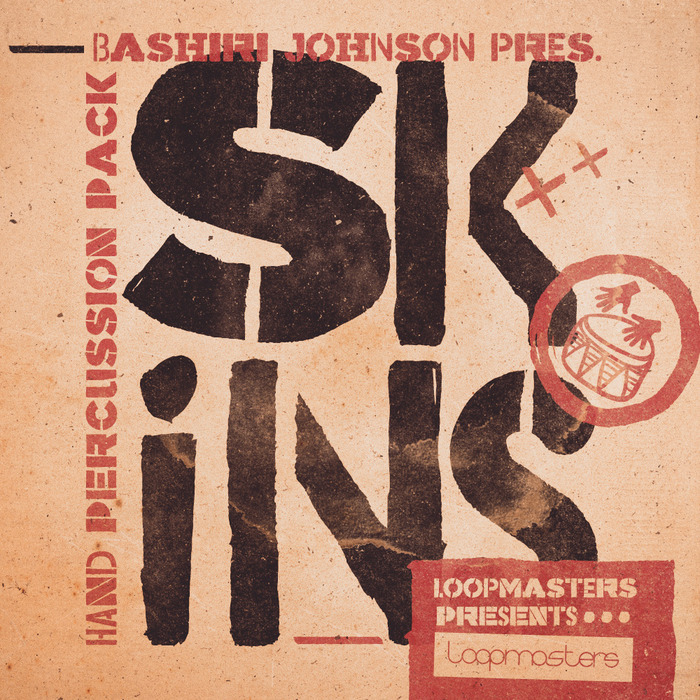 Loopmasters present SKINS, a protean collection of high end Percussion from the formidably talented NYC based rhythm master Bashiri Johnson. Featuring Sounds and Loops collected from a huge number of Drums and Percussion instruments, Loopmasters deliver 100% Royalty Free sounds ideally suited to productions in Music, Film, TV and media. 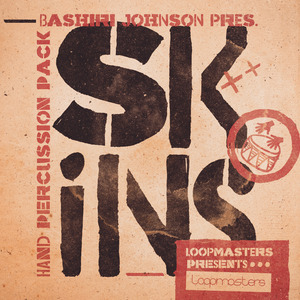 SKINS is the brainchild of Bashiri Johnson, Percussionist extraordinaire, who has contributed to a myriad of hit records, films, TV, games and more with artists including Beyonce, Paul Simon, Barbara Streisand, Michal Jackson, Miles Davis, Mary J Blige, Ray Charles, Aretha Franklin, Bob Dylan, Nina Simone, Queen, Herbie Hancock and so many more! Bashiri has an almost undefinable sense of flow and groove, and an innate desire for absolute excellence. SKINS features over 650MB of expertly cratered, organic and textured rhythms. Featuring 180 Loops and over 400 One Hit samples, Bashiri creates a rich tapestry of interwoven sounds to ignite your music and allow the groove to flow. Available as Construction Kits, Single Hits, Sampler Patches and Rex2 Loops; at high fidelity 24 Bit, SKINS has all the rhythms you need to make the crowd move and inspire your next track. SKINS features a worldly-inspired collection of percussion including Hand Drums, Shakers, Tambourines, Toms, Chimes, Cymbals, Tins, Djembes, Clicks, Bongos, Doumbek, Rattles and more! A total of 34 Construction Kits are included, each with Fully Mixed and component Loops to combine and intertwine into syncopated grooves and deep rhythmic travels. Each kit is divided into BPMS and will fit seamlessly together in a myriad of combinations. Over 400 One Hit samples provide a superbly cinematic accompaniment, with the natural and organic sounds captured in high end studios! The additional Rex2 Loops give you the power to trigger the pre-formatted slices to create new sonic experiments. At tempos from 80 to 170BPM, SKINS has all you need from Hip Hop to House, Breaks to Drum and Bass and so much more. A word from Bashiri Johnson: I have been blessed with the opportunity from Loopmasters to share what I love to share, what I love to do, and what I am: Rhythm. The making of SKINS had everything to do with impact, feel, and physical contact. I hope you will experience SKINS as a tool and a means to create great music. SKINS is intended to be a rhythmic journey, the evolving and unfolding was what made creating SKINS so rewarding for me. I hope this journey will be the same for you. In detail expect to find 692MB of content with 597 individual 24 Bit WAV files. 180 Loops are included in 34 Construction Kits, each contain a Full Mix and composite parts separately. 417 Percussion one hits are also included, with 184 rex2 Loops and 34 Sampler Patches for NNXT, Halion, Sfz, Kontakt and Exs24. SKINS is a wide ranging selection of natural percussive sounds, with a scope to work in a multitude of musical and atmospheric productions.